Contador reaches pre-agreement with Astana: the winners and losers. I'm so money, I'm so in trouble. Good news or bad news? Depends on the jersey. Two-time Tour de France winner Alberto Contador announced he’s reached a preliminary agreement with Astana to finish up the remainder of the contract that runs through the end of 2010. We’re assuming Michael “Chicken” Rasmussen wasn’t on hand to offer legal advice on the amusing issue of pre-contracts. Alberto will continue to ride for the donor team of Radio Shack, a roster stripped bare but now adding spare parts. After Johan Bruyneel’s tell-all dishathon about the Astana management — or lack thereof — it would be hard to say this is a team on the rebound. Building a strong team is more than a plug ‘n’ play proposition. This isn’t an X-Box game. Corralling and motivating big egos and pushing them to ride for somebody else isn’t a simple job. Throw in a director Sportif that hasn’t led a team at this level in years and you have a stir-fry for disaster. Winner: Alberto’s bank account, loser, the man with aspirations for a third Tour de France victory. The biggest loser is the team of Alejandro Valverde, the powerful Caisse d’Epargne squad. With a fifty-fifty chance that Valverde will have his two year ban in Italy extended to the entire cycling universe, Caisse will be the headless horseman for the grand tours. Management will wish they’d loaned Contador a few nasty lawyers and threw more euros and promised him a small island next to Johnny Depp’s tropical digs. Another loser: the credibility of the UCI. After a first round “no” on approving Astana’s ProTour license, a spokesman for the governing body said Alberto was legally free to leave Astana. Yet Alberto’s legal team apparently decided that UCI 2.15.139, article 8.1.f was not a Get Out of Kazak Jail Free card and couldn’t figure a way to extricate the Spanish rider. The UCI claim was widely reported and silently retracted. Another embarrassment for an organization that seems to have little control over anything including their own regulations. Winners: Andy Schleck and Lance Armstrong. A team in turmoil and re-organization with a depleted roster and problematic riders such as Alexander Vinokourov is less than likely to have the same firepower or cohesiveness it had under Johan Bruyneel’s firm hand. Twisted Spoke is guessing that most of Contador’s attacks in the 2010 tour will be “unscripted” because his team won’t have a script to begin with. There is laughter in Saxo Bank land and applause from Radio Shack. Lance and company succeeded in de-constructing Astana of quality riders like Andreas Kloden, Levi Leipheimer and Chris Horner. (They even took the shoe-shine guy.) 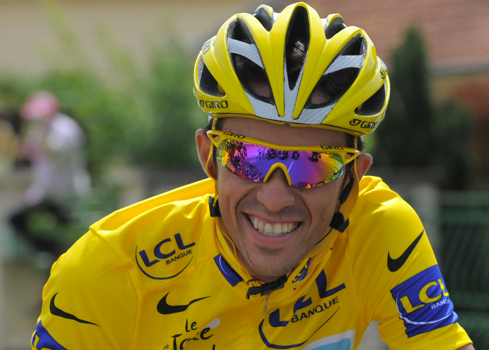 Contador will miss these top riders once the Alps and Pyrenees arrive in July. El Pistelero has plenty of money to count, whether he can count on his team is another question. « Cadel Evans calls Lance Armstrong fat.